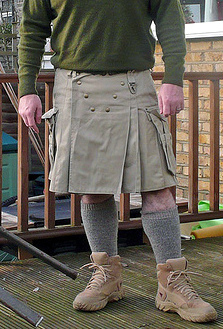 Outside Western cultures, men's clothing commonly includes skirts and skirt-like garments; however, in North America and much of Europe, the wearing of a skirt is today usually seen as typical for women and girls and not men and boys, the most notable exceptions being the cassock and the kilt. People have variously attempted to promote the wearing of skirts by men in Western culture and to do away with this gender distinction, albeit with limited general success and considerable cultural resistance. Skirts have been worn since prehistoric times. They were the standard dressing for men and women in all ancient cultures in the Near East and Egypt. The Kingdom of Sumer in Mesopotamia whose greatest achievement was the invention of writing recorded two categories of clothing. The ritual attire for men was a fur skirt tied to a belt called Kaunakes. The term kaunakes, which originally referred to a sheep's fleece was later applied to the garment itself. The animal pelts originally used were replaced by kaunakes cloth, a textile that imitated fleecy sheep skin. Kaunakes cloth also served as a symbol in religious iconography, as the fleecy cloak of St. John the Baptist. Depictions of kings and their attendants from the Old Assyrian Empire and Babylonia on monuments like the Black Obelisk of Salmanazar show men wearing fringed cloths wrapped around their sleeved tunics. Ancient Egyptian garments were mainly made of white linen. The exclusive use of draped linen garments and the wearing of similar styles by men and women remained almost unaltered as the main features of Ancient Egyptian costume. 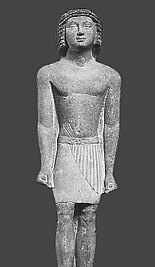 From about 2.130 BC during the Old Kingdom of Egypt, men also wore wrap around skirts (kilts) known as the shendyt, They were made of a rectangular piece of cloth wrapped around the lower body and tied in front. By the Middle Kingdom of Egypt there was a fashion for longer kilts, almost like skirts, reaching from the waist to ankles, sometimes hanging from the armpits. During the New Kingdom of Egypt kilts with a pleated triangular section became fashionable for men. Beneath was worn a triangular loincloth, or shente, whose ends were fastened with cord ties. In Ancient Greece the simple, sleeved T-shaped tunics were constructed of three seamed tubes of cloth, a style that originated in the Semitic Near East, along with the Semitic-based word khiton, also referred to as a chiton. The belted worn linen chiton was the primary garment for men and women. The Romans adopted many facets of Greek culture including the same manner of dressing. The Celts and Germanic peoples wore a skirted garment which the historian Diodorus Siculus (fl. 1st century BC) called chiton. Below they wore knee-length trousers. 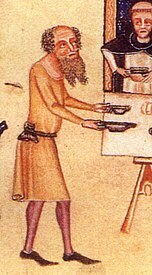 The Anglo-Saxons, Normans, Franks and other people of Western and Northern Europe continued this fashion well into the Middle Ages, as can be seen in the Bayeux Tapestry. Technological advances in weaving with foot-treadle floor looms and the use of scissors with pivoted blades and handles in the 13–15th century led to new designs. The upper part of dresses could now be tailored exactly to the body. Men's dresses were buttoned on the front and women's dresses got a décolletage. The lower part of men's dresses were much shorter in length than those for women. 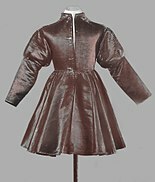 They were wide cut and often pleated with an A-line so that horse riding became more comfortable. Even a knights armor had a short metal skirt below the breastplate. It covered the straps attaching the upper legs iron cuisse to the breastplate. The innovative new techniques specially improved tailoring trousers and tights which designs needed more differently cut pieces of cloth than most skirts. 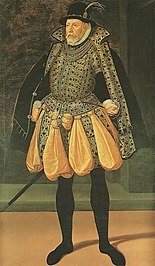 "Real" trousers and tights increasingly replaced the prevalent use of the hose (clothing) which like stockings covered only the legs and had to be attached with garters to underpants or a doublet. A skirt-like garment to cover the crotch and bottom was no more necessary. In an intermediate stage to openly wearing trousers the upper classes favoured voluminous pantskirts and diverted skirts like the padded hose or the latter petticoat breeches. Though during most of history, men and specially dominant men have been colourful in pants and skirts like Hindu maharajas decked out in silks and diamonds or the high heeled King Louis XIV of France with a diverted skirt, stockings and long wig. The French Revolution and the Industrial Revolution changed the dress code for men and women not only in France. From the early Victorian era, there was a decline in the wearing of bright colours and luxurious fabrics by men, with a definite preference for sobriety of dress. This phenomenon the English psychologist John Flügel termed "The Great Masculine Renunciation". Skirts were effeminized. "Henceforth trousers became the ultimate clothing for men to wear, while women had their essential frivolity forced on them by the dresses and skirts they were expected to wear". By the mid-20th century, orthodox Western male dress, especially business and semi-formal dress, was dominated by sober suits, plain shirts and ties. The connotation of trousers as exclusively male has been lifted by the power of the feminist movement while the connotation of skirts as female is largely still existing leaving the Scottish kilt and the Albanian and Greek fustanella as the only traditional men's skirts of Europe. In 1985 the French fashion designer Jean-Paul Gaultier created his first skirt for a men. Transgressing social codes Gaultier frequently introduces the skirt into his men's wear collections as a means of injecting novelty into male attire, most famously the sarong seen on David Beckham. Other famous designers such as Vivienne Westwood, Giorgio Armani, John Galliano, Kenzo, Rei Kawakubo and Yohji Yamamoto also created men's skirts. In the US Marc Jacobs became the most prominent supporter of the skirt for men. The Milan men's fashion shows and the New York fashion shows frequently show skirts for men. Jonathan Davis, the lead singer of Korn, has been known to wear kilts at live shows and in music videos throughout his 18-year career with that band. Mick Jagger from the Rolling Stones and Anthony Kiedis from the Red Hot Chili Peppers were photographed wearing dresses by Anton Corbijn. For an FCKH8 anti-discrimination campaign Iggy Pop was seen wearing a black dress and handbag. Guns N' Roses' singer, Axl Rose, was known to wear men's skirts during the Use Your Illusion period. Robbie Williams and Martin Gore from Depeche Mode also performed on stage in skirts. During his Berlin time (1984–1985) Martin Gore was often seen in public wearing skirts. In an interview with the Pop Special Magazin (7/1985) he said: "Sexual barriers and gender roles are old fashioned and out. [...] I and my girlfriend often share our clothes and Make-up". Brand Nubian Lord Jamar criticized Kanye West wearing skirts, saying that his style has no place in hip-hop. America is also not without its own contemporary advocates of skirts as menswear. One male blogger "denies that skirts are exclusively feminine garments" and suggests that the prevailing societal view reflects a "symbology of power" that persisted even in wake of the women's liberation movement. He suggests an apparent causality paradox in the perception of skirts as exclusively womenswear: "are skirts perceived as feminine because women wear them or do women wear them because skirts are perceived as feminine?" Though lamenting the lack skirts designed specifically for men, he discusses in detail how to "advance a viewpoint of masculine aesthetics" in his how-to guide for men. Other internet denizens echo these sentiments (with varying degrees of anonymity) in the "Skirt Cafe" internet forum "dedicated to exploring, promoting and advocating skirts and kilts as a fashion choice for men." However, the forum's moderators conspicuously assert that "this is NOT a transvestite or crossdresser forum. We are committed to a fundamentally masculine gender identity." 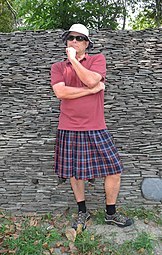 The wearing of skirts, kilts, or similar garments on an everyday basis by men in Western cultures is an extremely small minority. One manufacturer of contemporary kilt styles claims to sell over 12,000 such garments annually, resulting in over $2 million annually worth of sales, and has appeared at a major fashion show. According to a CNN correspondent: "At Seattle's Fremont Market, men are often seen sporting the Utilikilt." In 2003, US News said that "... the Seattle-made utilikilt, a rugged, everyday riff on traditional Scottish garb, has leapt from idea to over 10,000 sold in just three years, via the Web and word of mouth alone." "They've become a common sight around Seattle, especially in funkier neighbourhoods and at the city's many alternative cultural events. They often are worn with chunky black boots," writes AP reporter Anne Kim. "I actually see more people wearing kilts in Seattle than I did when I lived in Scotland," one purchaser remarked in 2003. In 2018, Zara added a skirt for men in its Reshape collection. Outside Western cultures, male clothing includes skirts and skirt-like garments. One common form is a single sheet of fabric folded and wrapped around the waist, such as the dhoti/veshti or lungi in India, and sarong in South and Southeast Asia, and Sri Lanka. In Myanmar both women and men wear a longyi, a wraparound tubular skirt like a sarong that reaches to the ankles for women and to mid-calf for men. There are different varieties and names of sarong depending on whether the ends are sewn together or simply tied. There is a difference in the way a dhoti and lungi is worn. While a lungi is more like a wrap around, wearing the dhoti involves the creation of pleats by folding it. A dhoti also passes between the legs making it more like a folded loose trouser rather than a skirt. In Sub-Saharan Africa, sarong-like garments sometimes worn by men are known as kanga (or khanga), kitenge (or chitenje), kikoy, and lappa. In Madagascar they are known as lamba. In West Africa Ghanaian chiefs use the iconic kente cloths for their representative chiton-like wraparound garments. Extremely beautiful are the leather skirts and finely embroidered tunics of the Wodaabe in Niger, which the men wear to display their enhanced beauty and to impress the unmarried women on the Gerewol dance festials. In Central Africa the formal attire of a Kuba official needs a red-black-white raffia-cloth skirt with bobble fringe. The Samoan Lavalava is a wraparound "skirt". These are worn by men, women and children. The women's lavalava pattern usually have either traditional symbols and/or a flower (frangipani) pattern. The men's lavalava have only traditional symbols. A blue lavalava is the official skirt for the police officers uniform of Samoa. For the hajj, the annual pilgrimage to Mecca, Muslim men wear the ihram, a simple, seamless garment made of white, terry clothlike cotton. One piece is wound skirt-like around the lower half of the body; the other is thrown loosely over one shoulder. The Qahtani sheep herders in the Southern Asir provence wear ankle-length skirt-like kilts. In Yemen standard dress is a calf-length, wraparound skirt, the futah. The Palestinians of the Eastern Mediterranean traditionally wear the qumbaz, an ankle-length unisex garment, which opens all the way down the front with the right side brought over the left, under the arm, and then fastened. 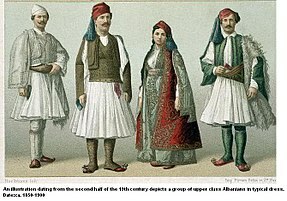 Other similar garments worn by men around the world include the Greek and Balkan fustanella (a short flared cotton skirt), the Pacific lava-lava (similar to a sarong), the Fijian sulu vakataga, some forms of Japanese hakama and the Bhutanese gho. The Fijian sulu is a long bark cloth skirt for men as well as women. It is still worn as Fijian national dress, in one of the more obvious versions of invented traditions, though today the cloth will be cotton or other woven material. A Fijian aristocrat will even wear a pin-stripe sulu to accompany a dress and tie, as full court dress. In East Asia, skirts that are called qun(裙) or chang(裳) in Chinese were also worn by men as well as dresses from ancient times until the end of the Qing dynasty in 1911. The Qin warriors of the first dynasty of Imperial China, wore a skirt-like tunic and a protective cuirass of bronze plates as can be seen on the excavated figures of the famous Terracotta Army. Portraits and statues of the revered Chinese scholar, Confucius show him wearing ample, enveloping silk robes. In Japan there are two types of the hakama for men to wear, the divided umanori (馬乗り, "horse-riding hakama") and the undivided andon hakama (行灯袴, "lantern hakama"). The umanori type has divided legs, similar to diverted skirts and pantskirts. The hakama is everyday attire for Shinto kannushi priests who perform services at shrines. Until the 1940s the hakama used to be a required part of common men's wear. Today Japanese men usually wear the hakama only on formal occasions like tea ceremonies, weddings, and funerals. The Hakama is also worn by practitioners of a variety of martial arts, such as kendo. ^ "...[despite] the best efforts of designers like Jean Paul Gaultier and others, the men's skirt has failed to gain popularity (though the kilt appears appropriate wear for men on certain special occasions)." Fiona Margaret Wilson (2003), Organizational Behaviour and Gender. Ashgate Publishing, Ltd. ISBN 0-7546-0900-6, p. 199. ^ Ribeiro, Aileen (2003): Dress and Morality. Berg Publishers. p. 169. ^ Fiona Margaret Wilson (2003). Organizational Behaviour and Gender. Ashgate Publishing, Ltd. p. 199. ISBN 0-7546-0900-6. ^ Jennifer Craik (1994). The Face of Fashion: culture studies in fashion. Routledge. p. 200. ISBN 0-415-05262-9. ^ Ribeiro, Aileen (2003). Dress and Morality. Berg Publishers. p. 169. ISBN 1-85973-782-X. ^ djvlad (1 February 2013). "Lord Jamar: Kanye's Skirt Has No Place in Hip-Hop" – via YouTube. ^ JungleBookJokes (19 January 2013). "Kanye West Was Serious About His Skirt Kilt" – via YouTube. ^ Lizzy Davies (2008-08-04). "The Frenchmen fighting for the right to wear skirts". The Guardian. London: Guardian News and Media Limited. ^ "Sweden's Arriva lifts shorts ban for skirt-wearing drivers". BBC news. 10 June 2013. Retrieved 16 July 2013. ^ "Swansea schoolboys keep cool in skirts after shorts ban". Daily Telegraph. 15 Jul 2013. Retrieved 16 July 2013. ^ "Why I Wear Skirts". 28 Nov 2016. Retrieved 3 Oct 2018. ^ "A Guy's Guide to Getting Skirted". 14 Feb 2018. Retrieved 3 Oct 2018. ^ "Introduction and Summary of the Rules". Skirt Cafe. 27 Aug 2007. Retrieved 3 Oct 2018. ^ Bolton, Andrew (2003). Bravehearts: Men in Skirts. Harry N. Abrams. ISBN 0-8109-6558-5. ^ a b c d Elizabeth Ann Ellsworth (2005). Places of Learning Media, Architecture, Pedagogy. Routledge. pp. 143–146. ISBN 0-415-93158-4. ^ "Elizabeth Ellsworth - Professor of Media Studies - Public Engagement". www.newschool.edu. ^ Staff (September 19, 2005). "It's a cargo skirt – for guys". Toledo, Ohio: WTVG-TV News. ^ Craig Harris (2007-01-26). "Manly skirt is not just for Scots anymore". Seattle Post-Intelligencer (online edition). Retrieved 2007-05-18. ^ "Escaping the tyranny of trousers". U.S. News & World Report. May 5, 2003. Archived from the original on March 17, 2007. Retrieved 2007-05-18. ^ Anne Kim (October 1, 2005). "Utilikilt makes 'short' work of job for men". The Ara\izona Republic (Online edition). Retrieved 2007-05-18. They've become a common sight around Seattle, especially in funkier neighborhoods and at the city's many alternative cultural events. ^ "Men's skirts sew success". BBC News. 2003-06-27. Retrieved 2010-05-12. ^ "H&M Offers Skirts for Men This Spring". nbcnewyork.com. ^ "Wrap skirt — Reshape — Shop by collection — Man". ZARA United Kingdom. Archived from the original on 2018-12-08. Retrieved 2018-12-08. ^ Helen A. Berger (1999). A Community of Witches: Contemporary Neo-paganism and Witchcraft in the United States. University of South Carolina Press. p. 43. ISBN 1-57003-246-7. ^ Dana D. Eilers (2002). The Practical Pagan: Common Sense Guidelines for Modern Practitioners. Career Press. p. 153. ISBN 1-56414-601-4. ^ Lisa Lenoir (2003-12-11). "Men in Skirts". Chicago Sun-Times. The Chicago Sun-Times Inc.
^ "rahsgeo - Nigeria". rahsgeo.wikispaces.com. ^ Findlay, Rosie (29 January 2014). "Why don't more men wear skirts?". The Conversation. Archived from the original on 10 October 2016.